The Yost Superior Co. designs, manufactures and supplies custom springs of all kinds to customers in dozens of industries nationwide, and we take precision and reliability to heart whether you’re ordering one piece or one million pieces. 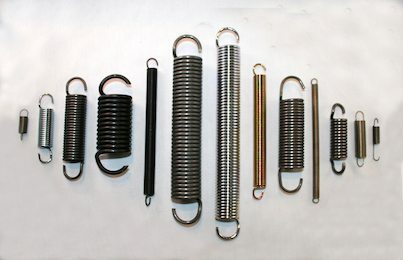 Compression springs, which are used to resist an applied force or to store energy in the push mode, which you’ll frequently find in valves, pumps and consumer goods, are among the most common types of springs. Available in straight cylindrical, conical, hourglass and barrel forms, we can help you further customize these springs by width and spacing to give you the best results for your application. We produce compression springs in wire sizes ranging from .005” to .625”. Each end of an extension spring (also known as a tension spring) is securely fastened to resist the pulling force of two points away from each other. Tension devices which use extension springs include garage doors, automatic washing machines, balance scales and toys. Typically constructed from round wire, The Yost Superior Co. can manufacture these springs to your material, weight and size specifications. We can make extension springs in wire sizes ranging from .005” to .625”. As opposed to compression and extension springs, torsion springs exert rotary force instead of axial force. Traditional wooden mouse traps, for example, feature a torsion spring that unwinds when allowed to release. Ratchets, many machine components, windows shades and clothespins also take advantage of this distinct load capability. Our wire range for torsion springs is .005” to .312” wire diameters. When you hear the term “wire form springs,” you should think “versatility.” A wire form spring does not necessarily come in the coiled arrangement you are accustomed with. 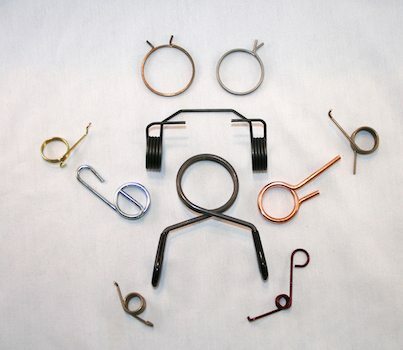 We bend spring wires into virtually any shape or size your application needs. This can vary from handles, straight wire and any particular bend or length needed. Much like wire form springs, stamped springs are customized precision pieces. From a strip of flat metal we apply special tooling to produce your parts – which could include slots, holes and distinctive bends. Many manufacturing industries turn to this type of spring for customized solutions. 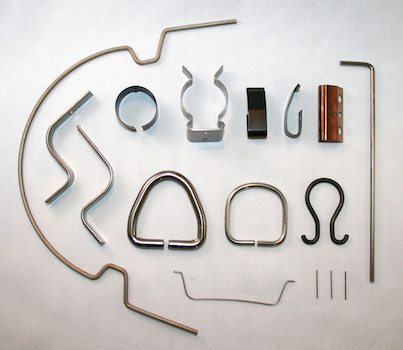 We produce stampings in sizes ranging from .090” thick x 3” wide material. When you order from The Yost Superior Co., you get more than just the right springs for your specific application – we also pledge to offer Fast Delivery and Superior Service. Call us at (937) 323-7591 to speak with an expert about the types of springs available to your business – you’ll be glad you did!